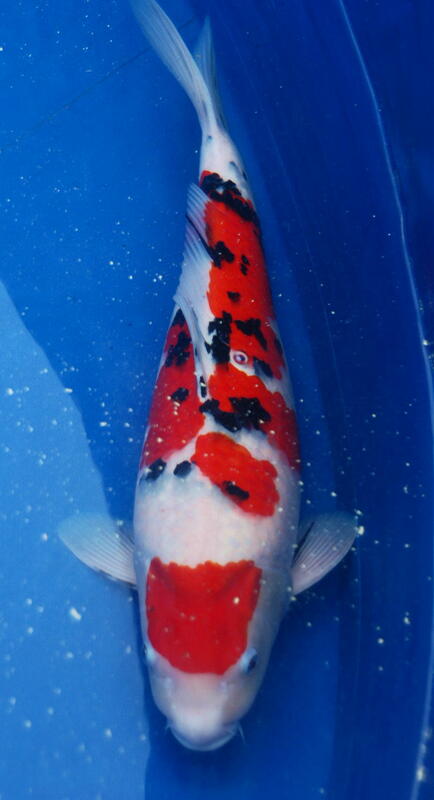 We have previously discussed Kohaku and Showa. 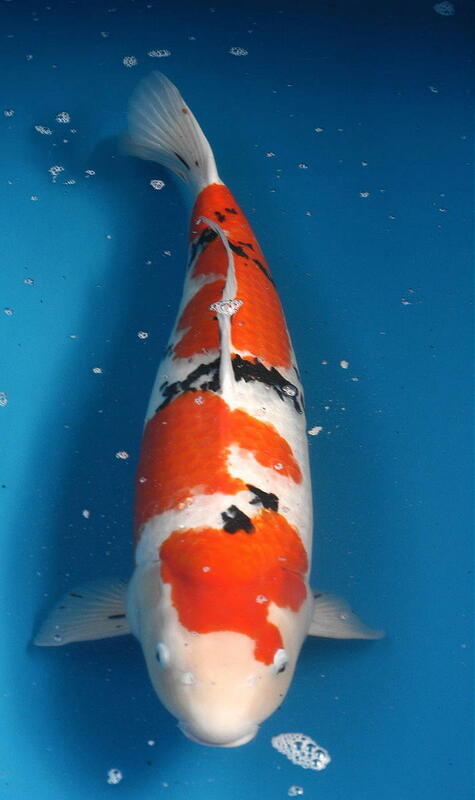 We now introduce Sanke, the third of the group of koi known as “Gosanke”. These three varieties traditionally win most major awards at koi shows. In most cases a Sanke can be easily recognized by the characteristic kohaku pattern (red patterning on a white fish) accented with black markings scattered about the body much like stepping stones. As with many varieties, there are a few “rules” which should be followed. One of these is that the head should be free of any black markings. Another is that the pectoral fins should have “tejima”, or thin black stripes, extending from the pectoral joint to about one-half the length of the fin. Other than these two rules, it becomes much a matter of personal taste as to the location, size, and number of black markings. In judging Sanke, a judge will consider the overall balance of the red and white markings – how well they compliment each other. If the black markings are concentrated in one area, such as near the tail, or all on one side, it creates an un-balanced and busy look. There should be a “focal point” on a Sanke, which would be a fairly large black marking on one shoulder. This is important enough to have its own name: “Kata Sumi”. Another appreciation point is that the black markings should be located on the white rather than on the red. This creates a more elegant and refined impression. In selecting young Sanke, in addition to the standard checklist of good health, solid body structure, and good skin quality, you should look for a pleasing kohaku pattern. A two- or three- step pattern tends to look very nice on a Sanke because there will be several white areas upon which the black stepping stones will hopefully appear. As with most varieties exhibiting black coloration, we cannot predict for sure where these markings will be. This is one challenge of selecting a baby Sanke. Most will have black markings as Tosai (one-year-olds), but these will frequently fade away to be replaced by permanent markings by the third year or fourth year. In general, the permanent black markings will be at approximately the same locations as the “baby black”, but you can also look closely for faint gray markings, which will emerge later as normal black.